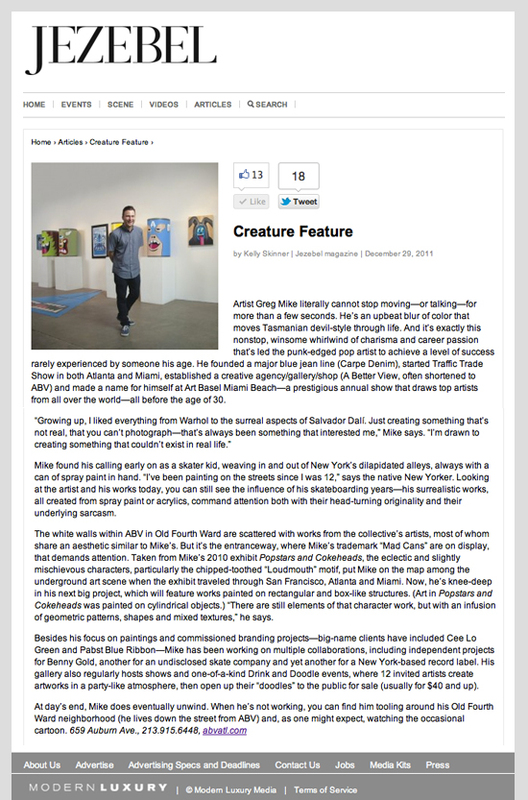 The day we were heading down to Miami for Art Basel, Jezebel Magazine stopped by ABV. They recently released this feature about their visit and our convo. Artist Greg Mike literally cannot stop moving—or talking—for more than a few seconds. He’s an upbeat blur of color that moves Tasmanian devil-style through life. And it’s exactly this nonstop, winsome whirlwind of charisma and career passion that’s led the punk-edged pop artist to achieve a level of success rarely experienced by someone his age. He founded a major blue jean line (Carpe Denim), started Traffic Trade Show in both Atlanta and Miami, established a creative agency/gallery/shop (A Better View, often shortened to ABV) and made a name for himself at Art Basel Miami Beach—a prestigious annual show that draws top artists from all over the world—all before the age of 30. Mike found his calling early on as a skater kid, weaving in and out of New York’s dilapidated alleys, always with a can of spray paint in hand. “I’ve been painting on the streets since I was 12,” says the native New Yorker. Looking at the artist and his works today, you can still see the influence of his skateboarding years—his surrealistic works, all created from spray paint or acrylics, command attention both with their head-turning originality and their underlying sarcasm. The white walls within ABV in Old Fourth Ward are scattered with works from the collective’s artists, most of whom share an aesthetic similar to Mike’s. But it’s the entranceway, where Mike’s trademark “Mad Cans” are on display, that demands attention. Taken from Mike’s 2010 exhibit Popstars and Cokeheads, the eclectic and slightly mischievous characters, particularly the chipped-toothed “Loudmouth” motif, put Mike on the map among the underground art scene when the exhibit traveled through San Francisco, Atlanta and Miami. Now, he’s knee-deep in his next big project, which will feature works painted on rectangular and box-like structures. (Art in Popstars and Cokeheads was painted on cylindrical objects.) “There are still elements of that character work, but with an infusion of geometric patterns, shapes and mixed textures,” he says. Besides his focus on paintings and commissioned branding projects—big-name clients have included Cee Lo Green and Pabst Blue Ribbon—Mike has been working on multiple collaborations, including independent projects for Benny Gold, another for an undisclosed skate company and yet another for a New York-based record label. His gallery also regularly hosts shows and one-of-a-kind Drink and Doodle events, where 12 invited artists create artworks in a party-like atmosphere, then open up their “doodles” to the public for sale (usually for $40 and up).